Guided by the Key of Dreams, Sakura embarks on a new adventure!It is spring, with cherry trees in full blossom, and Sakura is just entering middle school. Her beloved Syaoran has returned from Hong Kong, and life couldn't be better. 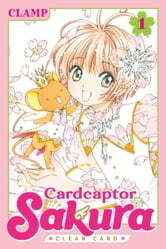 But when she awakens from a strange dream to find her Sakura Cards powerless, how can she protect Tomoeda from disaster? !With over 15 million copies in print in Japan alone, plus translations in over a dozen languages, the original Cardcaptor Sakura is an international phenomenon you can't miss! And now, the long-awaited new chapter begins! I was waiting forever for this book to come out and it did. I just loved te start to this continuatin from the original book sires.